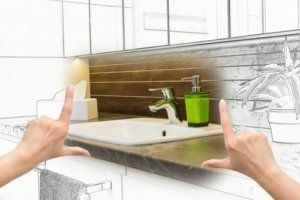 There is no doubt about it: when it comes to home improvement undertakings, one of the first rooms people look to update and remodel is the bathroom. The benefits are numerous. Whether it’s storage, appearance, efficiency or increasing your home’s value, remodeling your bathroom can offer an endless array of advantages for your family and your guests. Yet, despite these benefits, some homeowners are still reluctant to take the plunge. In fact, according to the National Kitchen and Bath Association (NKBA), the average cost to remodel a master bathroom is about $16,000. This price is cut in half to $8,000 for smaller-sized bathrooms. Homeowners have many options when it comes to bathroom remodels, and the total cost always depends on your style and budget. According to HomeAdvisor, the average bathroom remodel costs $9,313, however you can definitely spend less – between $3,500 and $7,000 – to spruce up the essentials in a small- to medium-sized bathroom. On the other end of the spectrum, a homeowner can easily spend $13,000 to more than $20,000 turning a master bathroom into a peaceful retreat or spa-like atmosphere. Typically, most homeowners spend an average of between $5,645 and $12,993, according to HomeAdvisor. At Republic West Remodeling, we always encourage our clients to carefully plan their bathroom remodeling ideas ahead of time then find the right bathroom remodeling contractor for the job. After all, asking questions, setting realistic expectations and budgeting from the start can literally make the difference between finding a contractor you trust and enjoy working with versus a long, frustrating few weeks. Determining your budget can be difficult when planning a bathroom remodel. One factor in determining cost will be the size, ranging from small to medium or master bathroom size. Also, remember that the fixtures you want to fit in your bathroom will range in price, depending on their size. This can include elements such as faucets and fixtures, new showers or baths, flooring, countertops, lighting and cabinetry. Answer the following questions early on in the process: Why are you remodeling in the first place? Is it to update the functionality? Or, is it to modernize the style? Remember who the bathroom is for: female, male, adult, kid? Do you want classic or contemporary, mid-century modern or shabby chic? Talk to your contractor about your remodel ideas, sharing images from magazines, online design ideas and paint samples from the hardware store. Remember: the more information your contractor has in advance, the more your remodel will turn out exactly how you want it. It’s important to choose the right bathroom remodeling contractor because selecting the wrong one can lead to wasting precious time and money, suffering extreme frustration and having a terrible overall experience. Contact us today for bathroom remodeling costs and the highest quality luxury home remodeling. We proudly serve Scottsdale, Phoenix and the Phoenix Metro area. Call (480) 428-2695 for your free consultation or contact us online.